Albert George "Ab" DeMarco Sr.
A "Class of 1964" inductee, Ab DeMarco Sr. was a member of the Reds 1939 Calder Cup of the winning team. Over five seasons with Providence from 1938 to 1943, DeMarco accounted for 213 points and 132 assists in 219 games. He was one of three players to lead the Reds in scoring during three different seasons and the only player to lead them in scoring for three consecutive years, 1940, 1941 and 1942. 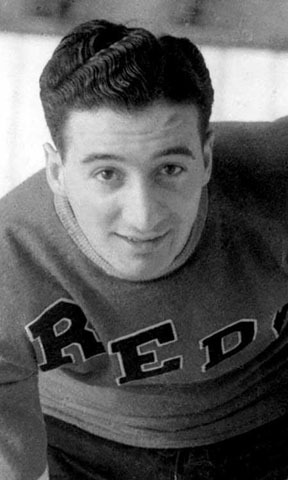 DeMarco would later become the AHL’s MVP and leading scorer with Buffalo in 1950. A veteran of seven NHL campaigns between 1938 and 1947, this center tallied 165 points and 72 goals in 209 games. He was the father of former Bruins forward, Ab DeMarco Jr.